I don't remember where I found this picture, but it was one that caught my eye and I love it! 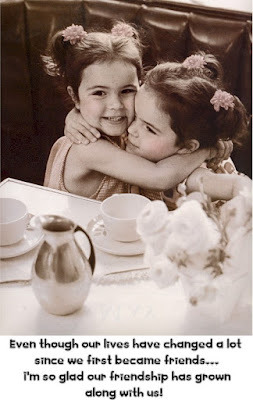 Two little girls at tea, sharing a lovely time together. The sentiment is beautiful as well. To me it says that although we have each grown and changed since we first met, our friendship has deepened and grown along with us. I feel this way about my lovely blogging friends. Each day I look forward to reading comments and sharing tidbits of daily life, homemaking, family, nature, and hobbies with you. And I love to visit your blogs and catch up with what's important to you. Thank you for the little window into your life and sharing what makes it important to you. That's what friendship is all about --- sharing our lives with one another. Friendship is a precious thing --- thank you for sharing yours with me. I don't have a blog but I sure enjoy sharing my life with you!! Such a sweet picture and I like what you've written! Thank you for your friendship too! Thank you too! It really is fun to have a growing friendship. I agree...you were one of my first...and so patient with my stitchery questions...you are a precious blogging friend. Thank you and your words are so true. I'll be thinking of your sister as she travels abroad. Oh and I love the photo through the window. Just lovely. I agree and love your words. Are those bulbs coming up on your sidebar this year's already? Our snow did go down a bit today. I feel the same way...thank you for putting words to your thoughts, and for sharing yourself too. Blogging seems to be the world's big back fence where we can all hang out and enjoy each other's company.